My Well Dressed Life: What's in my Jewelry Box? Last year I wrote a post where I shared my everyday jewelry, I'm definitely a person of habit and find myself wearing the same pieces almost daily. As a result, I thought it would be fun to share those things I wear the most on the blog today. This way you all can know the details of and why I wear the pieces I do! 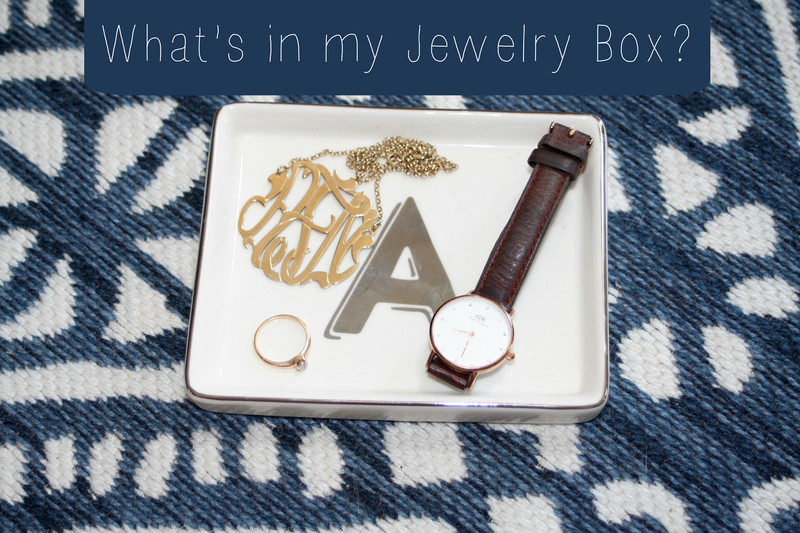 This is a little bit of a different post, but I hope you enjoy seeing what is in my jewelry box! 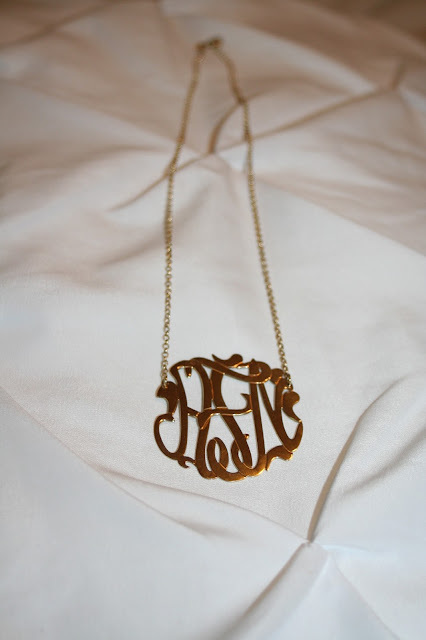 I just got this monogram necklace for graduation and it has already become an essential part of my everyday jewelry. I love pairing it with a simple graphic tee or a tank top in the summer. It adds that extra touch to an outfit without being as heavy as a statement necklace. This ring is one of my favorite things to wear and I just don't feel right when I'm not wearing it! My grandma gave it to me for my 16th birthday, it was hers and I have been in love with it ever since. It's simple and classic, so I can wear it every day which I love. It's the perfect everyday jewelry piece. There is nothing that I love more than a watch. I love wearing one of these two watches either by themselves or with some fun bracelets. I am almost always wearing one of these watches. The gold one makes a statement, while the leather one is more subdued and perfect for every day. In the last year, I have fallen in love with Alex and Ani bangles. I like wearing 2 or 3 of them for a nice accent to an outfit, especially in summer. 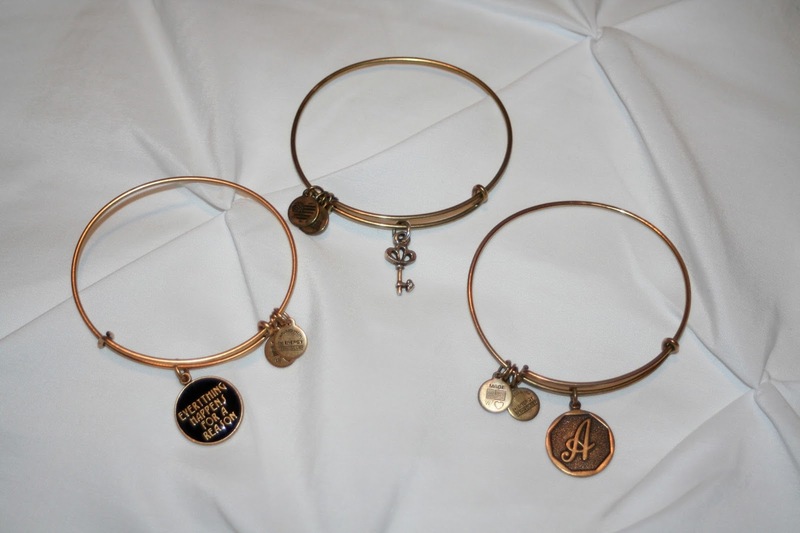 I look forward to growing my Alex and Ani collection in the future. I like having them to remember moments or important things in my life! My mom got this bracelet for me for my birthday and I love it so much. It is one of my favorite mantras and I love being able to wear it around on my wrist all the time! 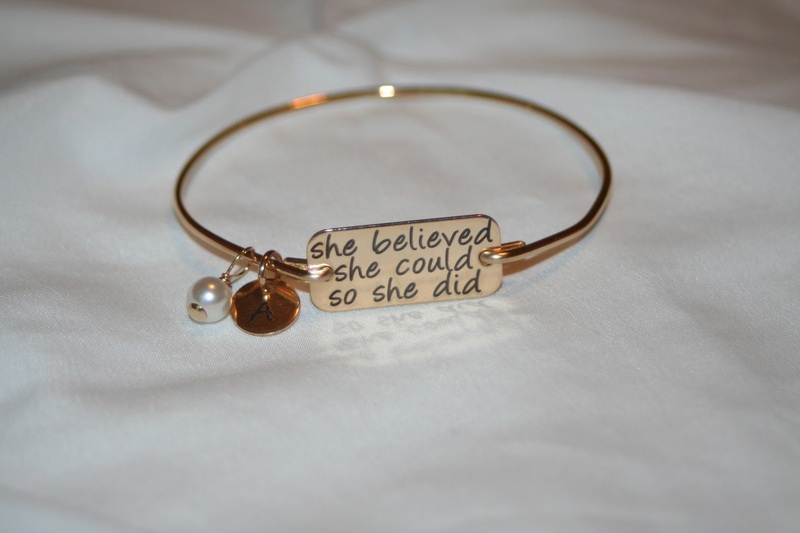 The thing that I think is really cool about this company is that you can personalize the bracelet, not only can you get whatever quote you want, you can also get charms to better represent you. I chose a pearl and an A both things I really love! This bracelet came from a local jewelry store when I was just born. My grandparents got it for me. I absolutely love the simple gold chain and the heart charm which has my monogram and birth date. 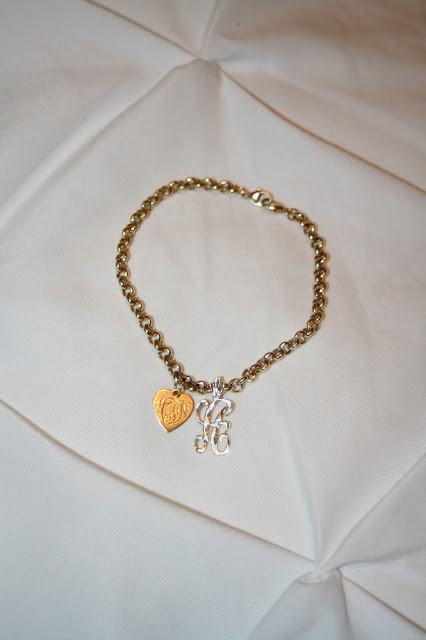 My grandpa recently gave me the A charm to add to the bracelet, which I love! This is the only piece of jewelry that I never take off. I wear it every day no matter what I am wearing. I hope you enjoyed taking a little peak into my jewelry box. 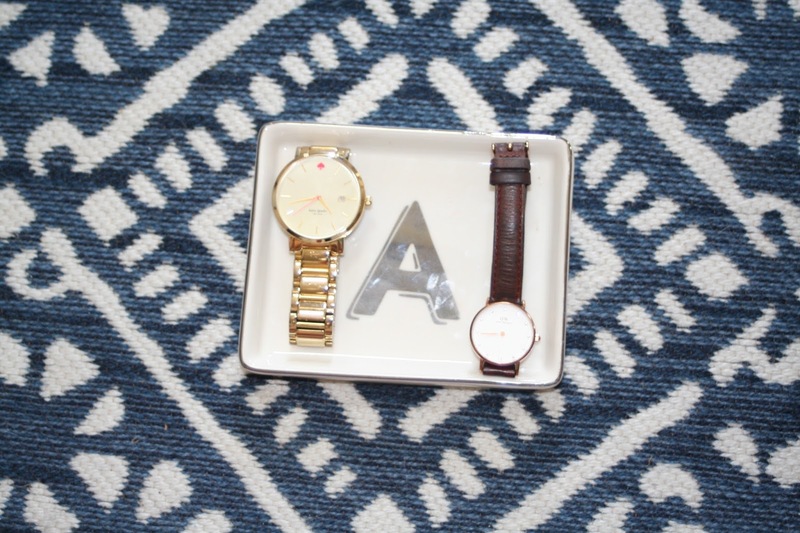 As I'm sure you can tell I am all about simple timeless gold pieces. What are some of your everyday jewelry essentials? Share with me in the comments below! 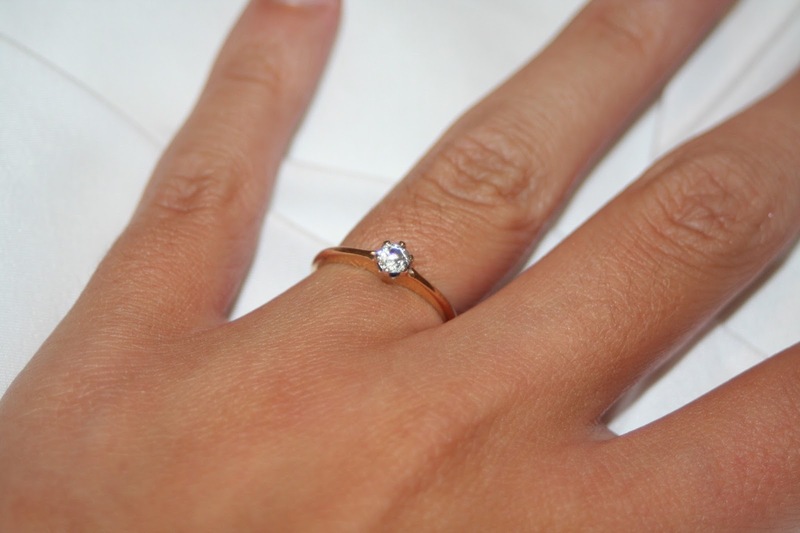 I love how each of your jewelry pieces is so meaningful to you! I'm a jewelry buyer (as my job) so it's neat to think that the pieces I'm buying could one day have the same story for my customers! That is so cool! Yes, I love having jewelry to remember a person or moment in my life! This is a really unique post idea! Love both your Kate Spade and DW watches!! Thank you! They are classics!